On Monday, most markets were closed for Christmas Day. However Japan was open, so there was a futures market in some instruments and USD declined slightly. However, as you might expect, the day was flat. Tuesday was an official holiday in British Commonwealth countries (Canada, Australia, New Zealand and the UK), and an unofficial holiday elsewhere. Equities were slightly down, in muted trading. USD recovered slightly, yields were slightly down, and Gold was slightly up. The only significant forex move was ZAR, up 0.9% continuing the Ramaphosa rally. The surprise mover of the day was Oil, which put on 2.61%. The markets fully resumed on Wednesday, but the equity flatness continued. USD continued to drift downwards against all currencies except JPY, and Gold rose again, and Oil was flat, holding the previous day’s gains. Notably, US 10-year bond yields fell sharply, giving up 7bp on the day. Thursday’s big (given the week) event was a 48 pip (0.43%) ramp in JPY with a matching fade in NKY. DAX also faded, but SPX and FTSE were flat. 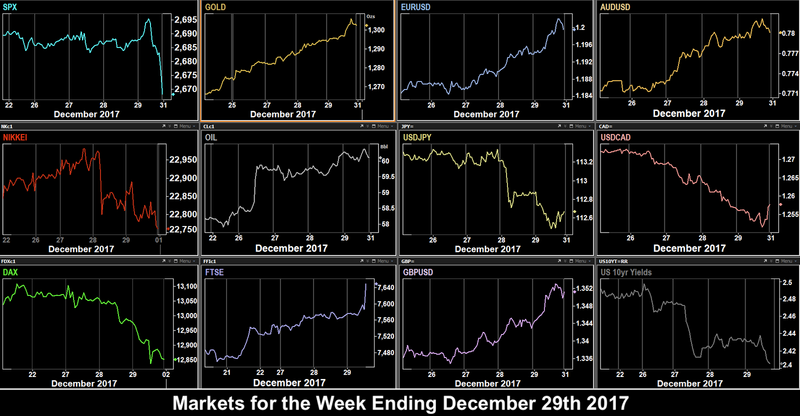 Otherwise, the pattern of the week continued — all currencies and Gold continued to climb against USD, and Oil rose slightly to break through the $60 psychological barrier. Yields recovered slightly. Finally on Friday, we saw some volatility. There was little synchronicity at all with indices. During the Asian session NKY fell, and DAX followed suit as Europe opened. 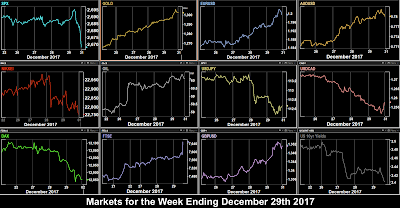 However SPX rose through this period as did FTSE, which had a sudden strong 0.9% ramp in the last 30 minutes before London trading closed at 1230 for the New Year holiday. Having hit a new intraday high of 2697.4 before the open, just shy of the next roundpoint, SPX did exactly the opposite of FTSE and after fading all session, suddenly crashed by 17 handles (0.65%) in the final 30 minutes. The FTSE ramp has been put down to energy, but the SPX sudden sell-off can only be attributed to year end rebalancing (ie taking profits to book in 2017). When currencies move in one direction all week, we often see a turnaround on Friday as profits are taken. Not this week, the USD fade, if anything accelerated, with only CAD turning down. Gold and bonds (inverse of yields) rose in line, and DXY closed at a three-month low. The holiday season is almost over and we are straight into a new year, and a four day week with both FOMC and NFP. Monday is New Year’s Day, and all markets (even Japan) are closed. Tuesday’s data is all PMIs, and little effect is expected. Of more significance is the post year end rebalancing which may cause volatility. Note Turkey and Japan’s markets are closed. API Oil Stock is not delayed, despite the Monday holiday. Wednesday is FOMC Minutes day, but these relate to the December meeting where rates were raised. However the plan for 2018 may be revealed in more detail. Also important is the ISM Manufacturing PMI, especially if it contradicts the Markit figure from the day before. Japan is still closed. German Unemployment figures in the European morning can move DAX and EUR, if of course they vary from the estimate. Thursday sees ADP, the ‘sneak preview’ of the Friday NFP report. The estimate is 190k roughly the same as NFP, and a similar estimate to previous months. A large miss could be the trigger to move US equities downwards, as we must assume the tax bill is fully priced in. The EIA Oil Stock report is a day late because of Monday’s holiday. Friday is the biggest day of the week. We have Eurozone inflation first. Last time the Euro was at 1.20, the ECB made noises about it being too high. A miss here would be a perfect opportunity for traders to sell. Then we have the dual NFPs from both sides of the 49th parallel. USDCAD hit two-month lows last week and anything negative from the Canadian side could result in a move up to at least 1.2625, the previous support which is now resistance. However, despite a record 79.5k jobs last month, the Canadian estimate is a conservative, and easily beatable 10k, whereas the US estimate is what we have come to expect. The pair is always volatile at this dual event. A Canada ‘win’ suggests the October support of 1.2470. Please be sure to recheck the estimates on the day, as they are often adjusted. Just to make it more exciting, there are also simultaneous releases of US and Canada trade figures. The focus stays with USDCAD, when both countries release PMIs at 1500. Also on Friday, we have three Fed speakers, Bullard at 0500, Harker (centrist) at 1515, and Mester (mild hawk) at 1730. Mester speaks again on Saturday 6th at 1515. This report is published every week as an email by MatrixTrade.com - you can sign up to receive it here. Please leave a comment. They are moderated and spam (links to your site) will not be published.